When it comes to innovation and specifically cloud solutions, this is truly great advice. Furthermore, the cloud is a journey, not a destination. Like the Internet the cloud will simply disappear someday from our day-to-day view and simply be the way solutions are deployed. But in the interim, there’s much to be considered. Dr. Henry Morris, IDC Fellow for Big Data, Cognitive, and Analytics: I’ve known Henry since my days at DIGITAL (DEC), and we while had a bit of the “getting the band back together”, he was true to form and had some great insights. Robert Mahowald, IDC Group VP for Applications and Cloud Business Models: as a nearly 30-year client of IDC I’ve seen both the value of his team’s research and how cloud has increasingly gained importance for applications delivery. Robert too was true to form and I gained some great new insights. 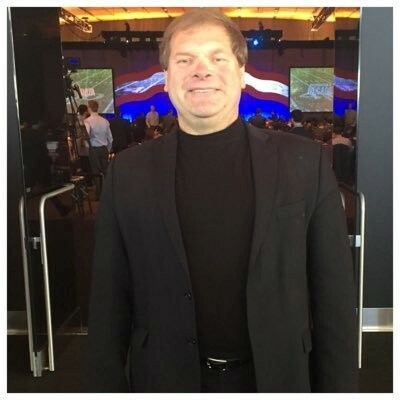 Clay Caldwell, National Vice President, SAP HANA Enterprise Cloud, SAP: Clay is a long-time SAP veteran like myself and has been involved with our SAP HANA Enterprise Cloud business since its inception. He offered some excellent insights and his ability to tie the dots together was pretty spectacular – I came away with a new appreciation of how to unlock latent business value with a cloud solution. Take the First Step: There’s a skills gap which organizations need to address. With the shift in our industry – illustrated by the IDC Third Platform – the set of skills and expertise required is changing. Robert showcased how the most successful organizations on their cloud journey seek out advice and assistance. As a typical male who hates to ask for directions (event when blatantly lost), I appreciated that as well as the requirement to take that first step when things are still relatively small. I think Lao Tsu would have gotten along well with Robert! Unlock the Underlying Business Value: The IDC Third Platform does a great job explaining the place that cloud solutions have in the new paradigm of computing that is driving massive change across virtually all organizations across all industries. I found Clay’s articulation of the benefits of cloud solutions and the merits of deployment options to among the best I’ve heard – a great “two minute” drill in the spirit of Tom Brady’s recent Super Bowl heroics and more (sorry Atlanta Falcons fans). As we look to drive growth, and both business and digital transformation through outcomes-based solutions at an accelerated place – with an eye towards reduced risk – a managed private cloud solution is the way to do it. We also do this with an eye towards shifting capital expenditures (CapEx) to Operating Expenditures (OpEx) in a way that allows value to be unlocked more quickly and efficiently. Adopting a Private Managed Cloud Makes Good Business Sense: Henry not only reviewed key challenges in deploying an SAP S/4HANA Solution, highlighting key issues such as switching applications, databases and infrastructure, but tied it back to the skills gap Robert highlighted. The result is a mix of risk avoidance and mitigation, where a service provider takes on the risk via a service agreement. With that there are key considerations from the deployment environment to the management responsibility which factor into both deployment options and the way its managed. I also gained new-found insights on why a customer should source this from their Systems Integration (SI) partner and not mix and match cloud providers to ensure maximum success. 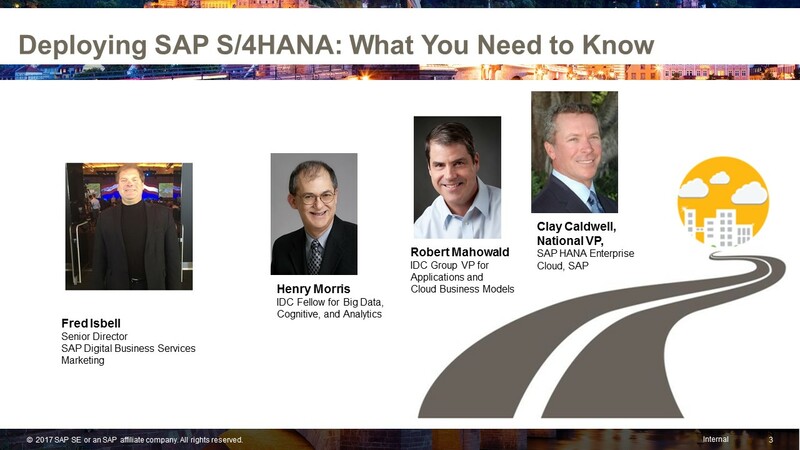 I encourage everyone to view the on-demand replay of “Deploying SAP S/4HANA: What You Need to Know” and to learn more and to download the new IDC Whitepaper “SAP HANA Enterprise Cloud A Managed Approach to Deploying SAP S/4 HANA – SAP HANA Enterprise Cloud”. And just think — if you run into Lao Tsu you’ll have lots to talk about when it comes to the cloud journey and much more. In the SAP realm, where we are already dealing with a complex application and a diverse delivery ecosystem spanning partnerships and developers to ensure a smooth deployment, migrating to HANA becomes an especially interesting proposition. If you fail to plan correctly, you will likely have a HANA project that will stall because of resource constraints. This unfortunately is a common scenario across the vast SAP customer community. A number of orphaned HANA initiatives never got off the ground due to poor planning. But there is plenty of reason to be optimistic! The general consensus is that 2017 is the year for a number of HANA initiatives to gain steam and 2018 will see a large number of ‘go live’ announcements. What is the major reason we credit for the turnaround? In a word, cloud. Immediate Access to Fully Configured, and Ready to Use, Elastic HANA Instances. The traditional process for deploying HANA instances would typically take anywhere from 6-8 weeks when efficiently managed and with resources available at the correct time slots. The alternative approach with a dynamic cloud infrastructure provides you SAP HANA instances in the cloud in 1 business day. Those instances are ready to use with pre-installed latest SP level and OSS notes. Simply pay as you go, so you do not incur fees for the slots when your project is on hold or in case you are reassigned to other critical tasks. Benefits include: cost optimization, ease and speed at which you can access a SOH or S/4 HANA instance, ability to leverage dynamic instances within your HANA project plan to remove bottlenecks, eliminates resource constraints and accelerate your HANA deployment. CapEx and Cash Flow Optimization: Not ready to move your critical production workloads to the cloud? No problem! 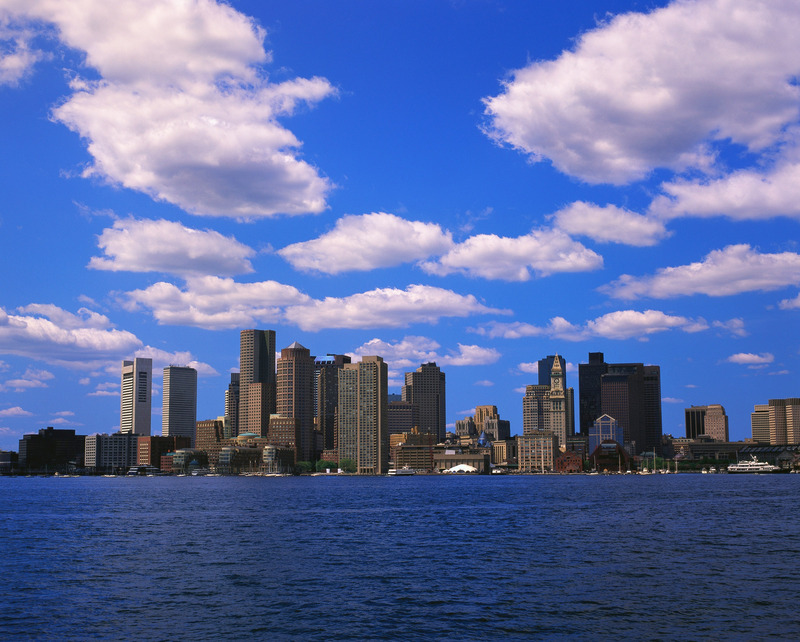 Consider leveraging the cloud for your non-production workloads. Seamlessly start-up and shut down workloads in the cloud within minutes. Add storage dynamically to easily meet QA testing requirements through a combination of automated provisioning of an application instance along with dynamic allocation of storage blocks to give you a user ready environment for executing your test scripts or load testing. Dynamic cloud instances give you a better simulation of your production landscape. All this for an operational budget that does not require you to purchase or lease hardware and operational software.! Benefits include: running your HANA testing and validation process in parallel without impacting your current production workloads, simulating what your current ECC/BW reports would look like in HANA and how your user community can improve their daily operations based on advanced analytics from HANA. Software Defined WAN (SD-WAN) Connectivity – Moving workloads between the cloud and on premise is much easier with a number of smart connectivity solutions. Beyond the usual suspects such as your current MPLS provider, I recommend you review some of the next generation providers. You can leverage their SD-WAN infrastructure to seamlessly connect your enterprise users to any of the SAP cloud providers. In addition to the connectivity framework you will also benefit from advanced features such as additional security, acceleration and content distribution. These smart connect solutions allow you to have a seamless experience whether your SAP enterprise application workloads are located within your enterprise or beyond. Once again bringing this back to your HANA projects, distributing your HANA analytics processing in the cloud and leveraging utilities like SAP Landscape Transformation Replication or other techniques to refresh from your OLTP database is economical and efficient with these forms of enterprise connectivity. With these technologies, splitting your Analytics from OLTP does not result in degradation of performance or latency related to results. SAP HANA Cloud Disaster Recovery – Investing in redundant infrastructure such as compute, storage etc., and then having it idle for the majority of time results in a significant amount of resources being underutilized. An ideal place for you to find those extra budget dollars to help with progressing your HANA project is to evaluate your current DR solution. Moving your DR solution to the cloud enables you to access on-demand resources when they are needed and utilizing your crucial budget to more productive use. Managed DR solutions for SAP HANA in the cloud provide you with a redundant application landscape that is sized to meet your production requirements in case of an unfortunate event at your primary data center. However, with the ability to rapidly provision, you don’t need to have that hardware sitting idle for most of the year while you still pay for it. You can pay for DR in the cloud when you run your DR tests and in the case of a DR event the pre-configured environments along with the runbooks can be utilized to support your SAP production environment. Cloud Management Platform: Most dynamic cloud infrastructures have standardized, simple to use platforms that enable you take advantage of the sophisticated cloud infrastructure. Gone are the days where you are expected to learn the protocols associated with each dynamic cloud infrastructure in order to use the advanced features. For example, Velocity’s Cloud Applications Management Platform (VCAMP), helps enterprise customers like you transform the way they manage their SAP applications on AWS. A simple user interface supported with a series of menu-driven choices lead you with business outcomes based decision making. You select the desired business outcome and let the software interact with AWS to deploy your SAP application instance and the appropriate storage blocks with the necessary backup routines so that the correct combination of components is selected and unified to deliver a complete solution. VCAMP also provides the level of visibility CIOs require so they can retain control over their data and application configurations. Using cloud management platforms to handle your HANA deployment allows you to bridge between your primary SAP application and HANA using a hybrid model, once again without the disruption or risk inherent in traditional approaches. If you have not already harnessed the cloud as part of your SAP HANA Roadmap – this is the ideal time to consider tapping the power of the cloud. Staying focused on quantifying the cloud’s benefits, proving the cloud’s productivity gains and relying on the cloud for recovery in the event of a disaster all help you build a strong and compelling business case for HANA.